Catherine Benincasa was born in Siena on Palm Sunday, March 5, 1347, the daughter of Giacomo Benincasa, a pious and prosperous dyer and his wife Lapa. It is said that when she was five years old, she was in the habit of saying the Hail Mary on each step of the staircase of the house. When Catherine was about six year old, she saw a vision of Christ and His Apostles while walking in the countryside with her brother. She was transfixed by the vision, in which the Lord, in the garb of a pope, blessed her. As one writer put it, "Such was the 'call' of Saint Catherine of Siena ... and the appearance of Christ, in the semblance of His Vicar [the pope], may fitly appear to symbolize the great mission of her later life to the Holy See". For the pope was not in Rome but in Avignon, France, the so-called "Babylonian Captivity" of the papacy, where for political reasons the papal court had moved -- and Catherine, years later, would attempt to persuade the pope to return to Rome, the See of Peter. At the age of sixteen Catherine took the habit of the Dominican Tertiaries (or "third order", a lay affiliation with the Dominican Order). After three years of celestial visitations and familiar conversation with Christ, she underwent the mystical experience known as "spiritual espousal" (or "mystical marriage" to Christ). Catherine then dedicated herself to the poor, the sick and the conversation of sinners. In the summer of 1370 she received visions of Hell, Purgatory and Heaven and a Divine command to enter the public life of the world. She began to dictate and dispatch letters to men and women in every condition of life, entered into correspondence with the princes and republics of Italy, was consulted by the papal legates about the affairs of the Church, and set herself to heal the wounds of her native land. She implored Pope Gregory XI to reform the notoriously corrupt clergy and the administration of the Papal States. Through her influence, the pope left Avignon and returned to Rome. On the fourth Sunday of Lent in 1375 she received the stigmata, that is, the wounds of Christ. In about 1378 Catherine composed her "Dialogue", said to have been dictated while she was in ecstasy, a book of meditations and reflections on the Creed and teachings of the Church, and on the sinfulness of man and the mercy of God. Her last public work was to aid in the reconciliation of Pope Urban VI and the Roman Republic. Catherine died April 29, 1380. 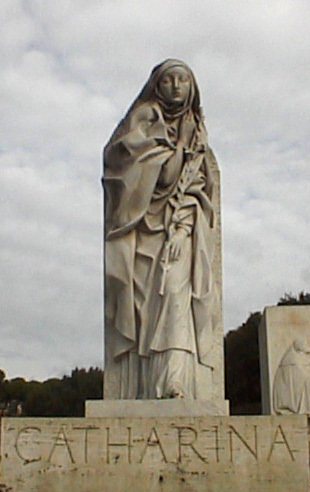 In 1970 Pope Paul VI proclaimed Saint Catherine of Siena a Doctor of the Church, a title given to certain ecclesiastical writers because of the benefit the whole Church has derived from their teaching and witness. This is the message we have heard from Him and proclaim to you, that God is light and in Him is no darkness at all. If we say we have fellowship with Him while we walk in darkness, we lie and do not live according to the truth; but if we walk in the light, as He is in the light, we have fellowship with one another, and the blood of Jesus His Son cleanses us from all sin. If we say we have no sin, we deceive ourselves, and the truth is not in us. If we confess our sins, He is faithful and just, and will forgive our sins and cleanse us from all unrighteousness. If we say we have not sinned, we make Him a liar, and His word is not in us. My little children, I am writing this to you so that you may not sin; but if any one does sin, we have an advocate with the Father, Jesus Christ the righteous; and He is the expiation for our sins, and not for ours only but also for the sins of the whole world. Holy Mary, our mother, pray for us. St. Dominic, glorious Patriarch, pray for us. St. Catherine benevolent mother of the poor, pray for us. St. Catherine, kind mother of the suffering, pray for us. St. Catherine, merciful mother of the sick, pray for us. St. Catherine, refuge of the sorrowful, pray for us. St. Catherine, intercessor for sinners, pray for us. St. Catherine, rose pf patience, pray for us. St. Catherine, model of humility, pray for us. St. Catherine, lily of chastity, pray for us. St. Catherine, vessel of graces, pray for us. St. Catherine, zealous promoter of the honor of God, pray for us. St. Catherine, luster of holiness, pray for us. St. Catherine, example of mildness, pray for us. St. Catherine, glory of the Order of Preachers, pray for us. St. Catherine, fruitful mother of spiritual children, pray for us. St. Catherine, promoter of peace, pray for us. St. Catherine, terror of the evil spirits, pray for us. St. Catherine, follower of Jesus, pray for us. St. Catherine, who didst give the blossoms of thy innocent youth to the service of thy Heavenly Spouse, pray for us. St. Catherine, who didst lead an angelic life in human flesh, pray for us. St. Catherine, who didst tear thy virginal flesh with scourges, pray for us. St. Catherine, whom Jesus, Himself, did feed with His Body and Blood, pray for us. St. Catherine, who didst exchange thy heart with the Heart of Jesus, pray for us. St. Catherine, who was blest with His Holy Wounds, pray for us. St. Catherine, who was taken to Heaven to the celestial nuptials, pray for us. St. Catherine, who didst receive a hundredfold, reward for all thy labors and merits, pray for us. Let us Pray: O God, who didst enable Blessed Catherine, graced with the special privilege of virginity, and patience, to overcome the assault of evil spirits, and to stand unshaken in the love of Thy Name, grant we beseech Thee, that after her example treading under foot the wickedness of the world, and overcoming the wiles of all enemies, we may safely pass onward to Thy glory.Through Christ Our Lord. Amen. Our catechesis today deals with Saint Catherine of Siena, a Dominican tertiary, a woman of great holiness and a Doctor of the Church. Catherine’s spiritual teachings are centred on our union with Christ, the bridge between earth and heaven. Her own virginal entrustment to Christ the Bridegroom was reflected in her celebrated visions. Catherine’s life also shows us the importance of the spiritual maternity exercised by so many women in every age. From this great saint let us learn to grow in holiness, love for the Lord and fidelity to his body, the Church.